The Troop Returns Digital Collection is now complete via the North Carolina Digital Collections. This collection includes lists, returns, records of prisoners, and records of draftees, from 1747 to 1893. The majority of records are from the Revolutionary War North Carolina Continental Line. Records dated after the Revolutionary War primarily deal with the county and state militia troops. “Return of the North Carolina Brigade of Foot commanded by Brigadier General Hogun.” Troop Returns. Military Collection. State Archives of North Carolina. For more information on how the Troop Returns are organized and what may be included please see the first blog post on the collection, or consult the digital collection landing page. To view the items in the collection in a list format, please see the Troop Returns finding aid. This entry was posted in Digital Collections, Government Records, News and tagged Digital Projects, military history, North Carolina Digital Collections on December 20, 2016 by Francesca. The Troop Returns from the State Archives of North Carolina Military Collection are now available online via the North Carolina Digital Collections. This collection includes lists, returns, records of prisoners, and records of draftees, from 1747 to 1893. The majority of records are from the Revolutionary War North Carolina Continental Line. “A list of the troop of Dragoons commanded by Captain Lawrence Thompson”. Troop Returns. Military Collection. State Archives of North Carolina. Militia records generally include the names of the officers and soldiers, and are usually organized by district or county. Continental Line records include field returns, general returns, draft records and enlistment records. These may be organized by military unit or location. When available, the commanding officers’ name is included in the item description and is searchable in the collection. This digital collection is currently in-progress, and more items will be added as they become available. Check back for the future post on the completion of the collection. For more specific collection information, including information on the items not yet available, please see the Troop Returns finding aid. This entry was posted in News and tagged Digital Projects, Genealogy, Military Collection, North Carolina Digital Collections on October 19, 2016 by Olivia. Ever wonder about the intricacies of a North Carolina Senate session? Want to find out what was discussed prior to the passing of a certain bill? Now you can through the newly uploaded Senate audio hosted via the Internet Archive. Links to each legislation day are available through the North Carolina Digital Collection website under, Senate Audio. Audio files can either be streamed online or downloaded for listener convenience. This collection currently provides access to almost 300 days from 2006 through 2010. Recordings made prior to 2006 are held at the State Archives and made available through a fee-based, digitization-on-demand basis. More Senate-related materials can also be found in the Archives including the Senate Clerk’s Office journals (SR 66.28) which provide the daily minutes from 1777-1981. This entry was posted in Digital Collections and tagged audio visual materials, Digital Projects, Internet Archive, North Carolina Digital Collections on September 1, 2015 by kevin. For more information on Agriculture in North Carolina check, out this list of articles at NCpedia. For more information on Science, Technology, and Innovations in North Carolina, check out this list of articles at NCpedia. 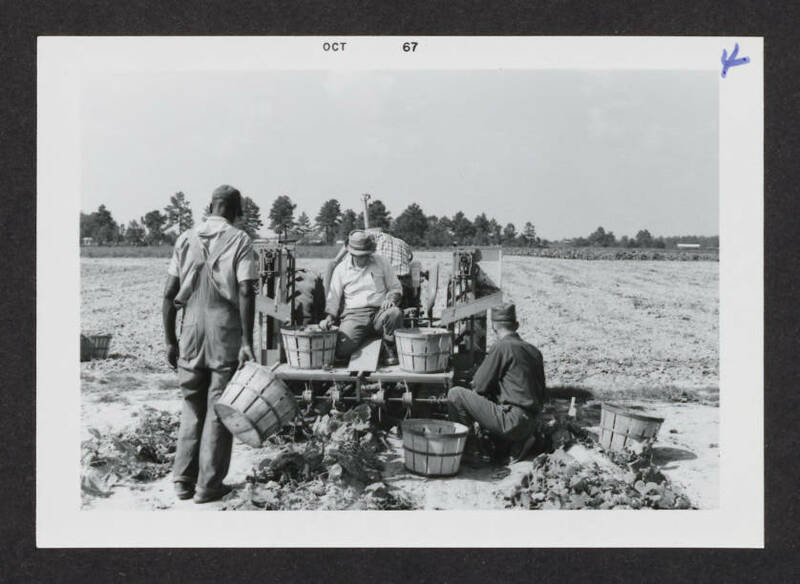 This entry was posted in Digital Collections, News and tagged Digital Projects, North Carolina Digital Collections, science on August 25, 2015 by Kat. I started work in mid-January after moving up from Atlanta. I’m very excited to be working at the State Archives of North Carolina. While I’ve read dream jobs aren’t really a thing, getting my position at the Archives certainly feels like I have found mine. I have always enjoyed history, but also have a love of technology. I had no idea that you could turn those two things into a profession. I have a B.A. from Agnes Scott College in Atlanta, Georgia, in Economics and Organizational Management (I know, right, where’d that come from?). Thinking about my future while at Agnes Scott, I was indecisive and I fell back on my first love, books. So after graduation, I attended the University of North Carolina at Greensboro to obtain a Master of Library and Information Studies (MLIS) degree. While attending UNCG, I was still unsure exactly what it was I wanted to do until I got a student position working on a grant in the Library’s Digital Projects department. I worked on a digitization grant project called “North Carolina Runaway Slave Advertisements” and I was hooked. It was everything I enjoyed: combining history with technology, learning new programs and hardware, all while getting to work with historical materials. My first experience working in an archives was at the National Archives and Records Administration in Atlanta. For my internship there, I completed a comprehensive finding aid on privateering during the War of 1812 with an accompanying database of information from the records. There is nothing better than getting to read about the exploits of a vessel called the Saucy Jack while handling early 19th Century documents. After I received my MLIS, I worked part-time at the Georgia State Archives on processing and digitization until I received a full-time grant position at Georgia State University. While at GSU, I worked on “Planning Atlanta—A New City in the Making, 1930s-1990s,” digitizing city planning publications and georeferencing city planning maps. Some of the projects I am working on at the State Archives include finishing the digitization of the 1901 Confederate Pension Applications, research for GIS video that will be used for an exhibit, and digitizing materials for the Civil War 150 blog. Last month, for Women’s History month, I also digitized and wrote a blog entry about the articles of incorporation for women’s colleges in North Carolina. For professional development, I am currently pursuing my Digital Archives Specialist certificate from the Society of American Archivists, which I hope to finish by the end of this year. So far, I have definitely felt that I have found my professional home. This entry was posted in Digital Collections, News and tagged Digital Projects, Digital Services Section, digitization on April 23, 2015 by Olivia. Researchers today enjoy many new tools at their fingertips – figuratively and literally. Any number of new digital repositories can give a researcher access to out-of-print books, rare books, census materials, state agency publications, city directories, maps, national records, international records – the list continues to grow. A recent and still growing database allows researchers to peruse newspapers – newspapers.com and Chronicling America by the Library of Congress. These scanned newspapers are indexed and searchable. As with any such searchable data the savvy researcher will understand that such a search engine is only the start. A search may seem overwhelming due to the number of “hits” returned on the word or phrase checked but one must remember that even though exhaustive such a search cannot and does not find all instances of the word or phrase. In addition to such an initial search a researcher should use good old fashioned legwork in the newspaper – using a microfilm edition – to see if there are things the data-search missed. One interesting side-benefit of having a searchable database of newspapers is that a researcher can see the way a story spreads across the news. In this world of instant social media where a YouTube post can trend and become an international sensation in a matter of hours, it is interesting to trace an arc of a story across United States newspapers in the 19th Century – to see a story, in effect, go the equivalent of 19th Century viral. The Wilmington Star (Wilmington, NC) reported Henry Berry Lowery dead in the March 6, 1872 issue. About the same time a Raleigh paper ran a similar notice of the death of Lowery. By April 1872 the Newberry Herald of Newberry, SC reported “dailies have teemed of late with the rumored accounts of the …killing of Henry Berry Lowery.” Papers around the country picked up the Wilmington or the Raleigh death article. The Wilmington account spread quickly and widely. On March 7th it appeared in a Washington, DC paper. On March 8th papers in Alexandria, VA, Wheeling, WV, Baltimore, MD, Rock Island, IL, and Richmond, VA carried the same notice. By March 14th the local paper in Upper Sandusky, OH ran the account on the front page. The next day it appeared in a Bolivar, TN newspaper. The Raleigh version popped up on March 7th in Charleston, SC. A week later it was in an Eaton, OH paper. On March 15th the local Albany, OR paper ran the Raleigh account of Lowery’s death. The Raleigh story appeared in a Washington, DC newspaper on the 18th and reached Paw Paw, MI on the 22nd. When the New York Herald ran the story written by the correspondent in the March 18th, 1872 paper that story too “went viral” and in a matter of days found its way to Winchester and Columbia, TN, St. Paul, MN, Staunton, VA and Charleston, SC. Elements of the article would continue to appear in newspapers across the US for many months to come. It is interesting to see how such sensational stories as the Lowery Gang captivated an audience and spread out over the media of the time – newspapers. Of course, it may be that checking microfilm of papers during this time period may yield other examples of the story bouncing around the continental United States. Due diligence serves every researcher. Another thing to consider when looking and researching in newspapers is how to handle missing issues. Inevitably, the newspaper in the town where your research interests have you looking for information is missing the years or issues germane to your research needs. Is the town or area in question near a railroad station? Is the community connected by rail to other nearby or even far away towns? For example, Weldon, NC is at one end of the Wilmington and Weldon railroad. If you can’t find the issue of the paper you need perhaps looking in the Wilmington papers a week or so after the event might get you the repeat of the Weldon newspaper story. The same is true for anything along the railroad line that ran from Charlotte to Raleigh – is the Hillsborough Recorder missing the year your ancestor died? Check any paper along that rail line from Raleigh to Charlotte and see if the death notice is picked up; particularly by local papers closer to the point of interest. A marriage notice might not gain much traction outside the immediate community but a death notice might – or, say, a murder. If you are looking for information on a local hotel in Salisbury but the Salisbury paper yields nothing – go down that rail line and see if a local paper elsewhere might be advertising that hotel. After all, if you see ads in the Salisbury paper for the Raleigh Yarborough House then you might expect the reverse to be true – Salisbury establishments in Raleigh newspapers. Railroads connect people and towns but also ideas and industry. This entry was posted in News and tagged Digital Projects, digitization, Genealogy, newspapers on March 25, 2015 by Chris. 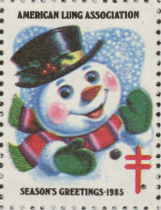 The Christmas Seal was developed to help in the fight against tuberculosis (TB). In the nineteenth century tuberculosis was a feared disease with no cure, it did not discriminate between rich or poor, and it ravaged its victims leaving them pale and emaciated until death finally took them. In 1871 a doctor discovered that fresh air and rest could cure TB. As news of this cure spread, so did small clinics where doctors could treat small numbers of patients and, in 1907, one such clinic sent out a plea for help. They needed to raise money or they would have to close their doors to the sick. It was in the fight to keep this small clinic alive that Emily Bissell spearheaded the origin of the American Christmas Seal and the forming of the American Lung Association. To read the full story, read either The Story of the Christmas Seal or the Crusade of the Christmas Seal. We hope you enjoy the new additions to “Carolina Christmas” and have a happy holiday season. This entry was posted in Digital Collections, Digital Projects, News, Special Collections and tagged American Lung Association, Christmas, Christmas Seals, Digital Projects, North Carolina Digital Collections, Organization Records on December 17, 2014 by tiffmaz.